Aikido is a 20th century martial art developed by Morihei Ueshiba sensei, known to many aikidoka (aikido practitioners) simply as O-Sensei. 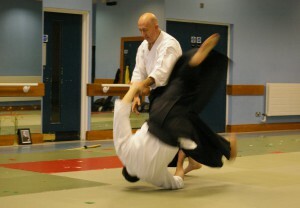 It is a compassionate but assertive and effective martial art based around throws and locks or pins. It has a more flowing nature than many martial arts and the ability to fall gracefully is considered one of its more unusual aspects. It is suitable for all people of all ages. And so one translation is often The Way of Harmony, but a more accurate interpretation to reflect the art might be The Way of Harmony with another’s Energy. 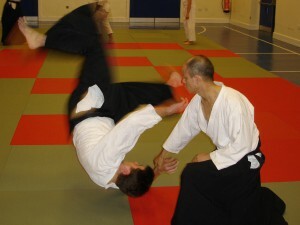 Correctly executed Aikido does not depend upon strength, which indeed may be an impediment to good technique, but relies on sensitivity to the movements of an attacker and carefully channelling their movements to allow them to fall or be controlled in some other way. 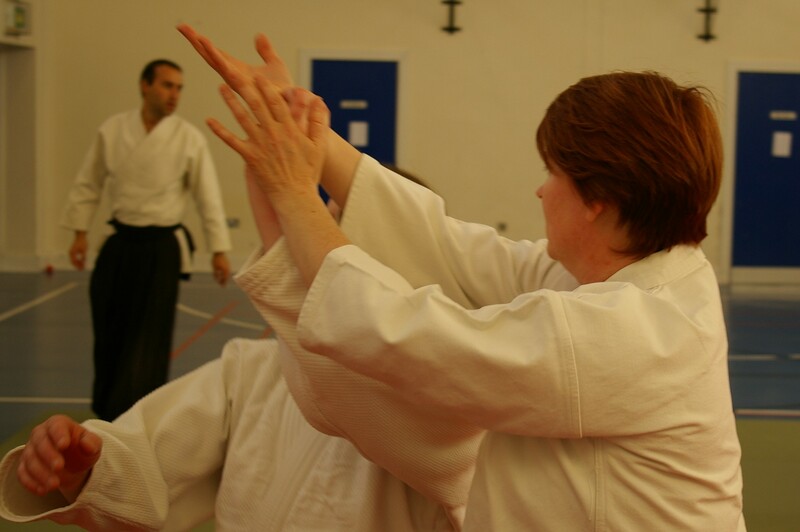 While the art is descended from Daito Ryu Aiki Jujutsu, where the “aiki” principle was used for killing intent, the modern Aikido is concerned with not setting out to destroy the opponent, but to protect all the people in the conflict where possible. It is possible to train effectively in Aikido with little fitness, but it is also possible to train in a way which provides vigorous exercise, as each individual practitioner may wish. While some styles of Aikido sought to make a sport from the art, our style of Aikido is traditional in that it is non competitive – the only competition is with one’s self. Even in gradings your opponent will provide you with an opportunity to show your skill. While we have grades we have only two colours of belts, white and black. 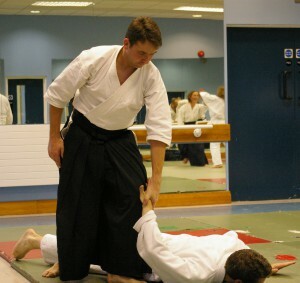 We have no restrictions on who can wear hakama and always attempt to train in a nurturing atmosphere but always remembering the martial aspect of the art. We principally follow the Aiki No Michi syllabus as it was created by the late Alan Ruddock sensei, and follow both the style and teaching that Alan taught us, but also that of Henry Kono sensei. Both were direct students of the founder of Aikido, O-Sensei, as well as experiencing the teaching of many of the other top students of O-Sensei. You can read an interview with Alan as well here. You can also read some of Alan’s recollections of his time in Japan here.